Even at nightfall, it’s easy to spot signs of Ghana’s growing wealth in downtown Accra—from the Toyota (TM) Land Cruisers scattered among honking taxis to the ripples of laughter that emanate from a packed rooftop lounge. There’s the young man window-shopping for electronics as he talks on his cell phone, while nearby, three Chinese executives climb into a sedan. But nothing beats the massive illuminated red-and-white bucket perched atop a 20-foot pole, emblazoned with a grinning, goateed Colonel Harland Sanders. For Americans, Sanders may be the faded icon who founded Kentucky Fried Chicken (now KFC) 60 years ago. For Ghanaians, the Colonel, who just arrived in September, is a symbol that their small West African country is now on the map. “This nearly $88 billion increase in exports to China from 2000 to 2011 exceeded the increase to every other market for US goods and farm products, with the exception of Canada. US exports to Canada rose $102 billion over the same period, while US exports to Mexico rose $86 billion. Brazil was a distant fourth with just a $28 billion increase in purchases of US products,” Ennis said. “Forty-eight states have registered at least triple-digit export growth to China since 2000, far outpacing exports to the rest of the world, and twenty of those states have experienced quadruple-digit growth,” Ennis said. “American companies from every corner of the nation are exporting high-value computers, electronics, agricultural products, chemicals, transportation equipment, and machinery to an expanding marketplace in China,” Ennis concluded. ü 48 states have registered at least triple-digit export growth to China since 2000, far outpacing growth in their exports to the rest of the world. Twenty of those states have experienced quadruple- digit growth.ü 10 states have at least doubled their exports to China since 2009, while three of these states— South Carolina, South Dakota, and Vermont—have more than tripled their exports to China in the past two years. ü 30 states now count China as one of their top three export markets and 25 states exported more than $1 billion to China in 2011, with export categories reflecting a broad range of products. In matters of public policy, however, it seems to work just fine. export jobs would really disappear if the bank did. subsidize and support the export programs of their domestic countries. that unilaterally disarms in global competition? truly vanish in the absence of such programs? Unthinkable. and Pacific Northwest Rail News. Police officers ‘on the job’ from Warsaw to Minsk will now be able to not only carry on a time-honored tradition, but expand their waistlines, as well with the news of Krispy Kreme’s efforts to offer franchises in Russia and Eastern Europe. The North Carolina-based company said that it’s offering franchises throughout the region at between $1 million and $2 million a piece. According to sources, Krispy Kreme is concentrating its initial efforts in Moscow, which currently ranks third on the Top 10 list of most attractive cross-border retail destinations in Europe after London and Paris, according to business consultant Jones Lang LaSalle. The Export-Import Bank faces an uncertain future following the Senate’s failure to advance bipartisan legislation this week to reauthorize the bank’s charter for four years and increase its lending limit due to Republican leadership opposition, with a Democratic aide saying the Senate has already missed its “best shot” for renewal. The Ex-Im charter expires on May 31 and its financing limit is expected to hit its current $100 billion in late April or May, at which point it could no longer offer financing to foreign buyers of U.S. exports. On March 20, the Senate fell five votes short of the 60 needed to invoke cloture on an Ex-Im amendment sponsored by Sen. Maria Cantwell (D-WA) to the House passed H.R. 3606, a bill that would make it easier for start-up companies to access capital markets. The cloture motion garnered 55 votes, with 44 in opposition. The Cantwell amendment would have extended the Ex-Im’s charter through 2015 and increased its lending limit to $140 billion from $100 billion. Senate Majority Leader Harry Reid (D-NV) and his staff are now evaluating other potential vehicles for Ex-Im renewal, the Democratic aide said. Reid is reluctant to bring the Ex-Im reauthorization to the floor as a standalone measure, as has been suggested by Senate Republican Leader Mitch McConnell (R-KY), because it would make it easier for the House to defeat it. Long-term Ex-Im authorization faces opposition in the House from Majority Leader Eric Cantor (R-VA), who has floated a bill with a one-year extension and requirements for the administration to negotiate an end to all forms of official export credit financing (Inside U.S. Trade, March 9). Senate Democrats tried to circumvent the House opposition to a long-term Ex-Im reauthorization by adding it as an amendment to H.R. 3606, which the House passed by a vote of 390 to 23 on March 8. According to the Democratic aide, partnering Ex-Im renewal with an overwhelmingly bipartisan piece of legislation was the “best shot” for a comprehensive reauthorization of the bank. House Ways and Means trade subcommittee Ranking Member Jim McDermott (D-WA) said on March 22 he was “fearful” about what would become of Ex-Im between now and the end of the congressional session. He added the bank has been drawn into a “theological argument” over the role of the free market. Business groups are actively lobbying both chambers of Congress to chart a path forward on Ex-Im reauthorization and are also urging senior-level White House officials to intervene. President Obama has been an outspoken supporter of the Ex-Im bank. Following the Senate’s passage of H.R. 3606 yesterday (March 22), the White House issued a statement calling on Congress to reauthorize the Ex-Im bank, among other priorities. Reid bristled at this, citing Cantor’s outspoken opposition to the Cantwell amendment and to the Ex-Im Bank in general.”[Members of the House leadership] are not about to take the Ex-Im Bank unless it’s part of the overall package,” Reid said, referring to the House-passed H.R. 3606. An Obama administration official emphasized this week that the Senate Democratic leadership appears willing to consider all options for bringing Ex-Im legislation to the floor, including moving it as a standalone bill. The official said the Senate Democratic leadership understands that the deadline is looming for Ex-Im Bank renewal, and is doing what it can to get a reauthorization bill passed in time. According to the official, the administration’s preferred approach would be to have the Senate move prior to the House on Ex-Im reauthorization legislation, but in a way that would allow Republicans to offer amendments to the bill. That could take extensive Senate floor time, unless Reid and McConnell reach an agreement on the number of amendments members can offer. Enabling Senate Republicans to offer amendments would provide an opportunity to address some of the objections that Republicans in both chambers have raised to the Ex-Im reauthorization, according to the administration official. These include the charge that Ex-Im is not complying with its congressional mandate to vet transactions for potential harm to U.S. industry, including U.S. airlines. If those objections are addressed or at least come to a vote in the Senate, that could provide some cover for House Republicans to vote in favor of the bill, according to the administration official. The last two House votes on Ex-Im reauthorization, in 2006 and 2002, occurred through a voice vote under suspension of rules, meaning lawmakers did not have to go on the record with their votes, the official pointed out. However, votes under a suspension of the rules normally take place for non-controversial measures, which then require a two-thirds majority for approval. The main stated reasons by Republicans for their opposition to the Ex-Im amendment to H.R. 3606 was that they could not offer their own amendments to it and that it would further delay passage of the bipartisan H.R. 3606. They could not offer amendments because Reid had used the procedural maneuver of “filling the amendment tree” with technical amendments to the H.R. 3606 to preclude other senators from offering any further amendments. But the Senate Democratic aide said the fight over the amendments was secondary to the larger political motivations of Republicans in blocking the Cantwell amendment. According to the aide, McConnell was “running interference” for the House leadership, because a vote on the Ex-Im measure would have threatened to splinter the Republican caucus by including a measure opposed by conservatives in H.R. 3606, an otherwise overwhelmingly bipartisan piece of legislation. Cantor’s office issued a statement a day before the vote blasting Democrats for attempting to add the Ex-Im amendment, dubbing it a “partisan measure.” He also opposed Democratic efforts to add further investor protections to H.R. 3606. Reid expressed the urgency of passing the Cantwell amendment ahead of the cloture vote, saying that if the Senate failed to adopt it, it would “drop to the bottom of the [Senate] calendar.” This, he said, is because the Senate is faced with other high-priority legislation related to cyber security, violence against women, and funding for the U.S. Postal Service. Any hope of resubmitting Cantwell’s Ex-Im language as an amendment to H.R. 3606 was dashed March 21 when the Senate invoked cloture on the underlying bill itself. Cantwell’s amendment was then formally dropped, as Senate rules stipulate that all amendments offered post-cloture must be germane to the bill they amend. Only three Republicans — Sens. Dean Heller (R-NV), Scott Brown (R-MA) and Susan Collins (R-ME) — voted in favor of the Cantwell amendment. The amendment failed to attract support even from two of the Republicans who co-sponsored it, Sens. Lindsey Graham (R-SC) and Richard Shelby (R-AL). Sen. Mark Kirk (R-IL) also co-sponsored the amendment, but he was not present at that Senate session. Sen. Bernie Sanders (I-VT), who caucuses with the Democrats but has historically opposed Ex-Im lending, voted against cloture. Conservative Republicans, fueled by small-government groups like the Club for Growth, object to Ex-Im reauthorization because they consider the bank to provide “corporate welfare” that distorts the free market. That fight has been compounded by opposition from Delta Airlines and other U.S. carriers, who argue Ex-Im support for purchases of Boeing aircraft by foreign airlines has harmed their business. At the same time, House Republicans are under pressure from Boeing and business groups, including the U.S. Chamber of Commerce, to approve a long-term reauthorization of the bank. Prior to the vote, McConnell said that “substantial support” exists among Senate Republicans to pass the Ex-Im bill on its own. The administration official said a standalone bill would like garner between 70 and 80 affirmative votes, while private-sector sources have speculated it would garner as many as 80 to 85 votes. Once the bank’s lending limit is reached, no new lending could take place until existing loans came off thebooks, which the administration official said occurs at a rate of about $1 billion a month. By contrast, Ex-Im usually processes transactions worth between $2.5 billion and $3.5 billion a month. Even if the limit is reached, an Ex-Im bank spokesman stressed that the bank still has “a fiduciary responsibility to the taxpayer” to continue to monitor its portfolio and pay claims on the loans it has issued. The process by which the bank would keep that ability in place is uncertain, but the spokesman likened it to contingency plans the U.S. government has in the event of a government shutdown. The administration official stressed that the Senate’s failure this week to pass Ex-Im reauthorization legislation has “rattled” foreign companies who have come to rely on the bank as a stable and reliable lender. These companies are already beginning to look to suppliers in other countries as opposed to buying from U.S. firms, the official said. For instance, foreign airlines may be more willing to buy planes from Airbus than Boeing, since the export credit agencies that help finance Airbus sales are seen as more stable than Ex-Im. Under the direction of Minority Leader Mitch McConnell (R-KY), Senate Republicans today (March 20) stonewalled a Democratic effort to secure a vote on legislation to reauthorize the Export-Import Bank for four more years. The bill, an amendment sponsored by Sen. Maria Cantwell (D-WA) to H.R. 3606, garnered 55 votes in support, five short of the 60 votes needed to invoke cloture, which would have limited the debate as a major step toward passage. The defeat resulted from a larger fight over whether Republicans could offer amendments to the Ex-Im provision offered by Cantwell or to a another Democratic sponsored amendment that would have altered the underlying H.R. 3606. H.R. 3606 is a House-passed bill that would make it easier for start-up companies to access capital markets. Prior to the vote, Majority Leader Harry Reid (D-NV) warned that if the Senate did not attach the Ex-Im bill to H.R. 3606, it would “drop to the bottom of the [Senate] calendar.” This, he said, is because the Senate is faced with high-priority legislation related to cyber security, violence against women and funding for the U.S. Postal Service. McConnell said on the floor before the cloture vote on the Ex-Im amendment that “substantial support” exists among Republicans to reauthorize the Ex-Im Bank, but urged his colleagues to vote against the amendment, citing an urgent need to send H.R. 3606 to the president’s desk for signature. H.R. 3606, touted by the GOP as a jobs measure, passed the House on March 8 by a vote of 390 to 23. Had cloture been invoked on the Ex-Im amendment, it likely would have been attached to H.R. 3606. That bill would then have been sent back to the House for further deliberation. The bank’s current charter expires on May 21, and McConnell said he would be willing to consider the Ex-Im legislation on its own, with “very few amendments.” Reid bristled at this, citing House Majority Leader Eric Cantor’s (R-VA) outspoken opposition to the Cantwell amendment and to the Ex-Im bank in general. “[Members of the House leadership] are not about to take the Ex-Im Bank unless it’s part of the overall package,” Reid said, referring to the House-passed jobs proposal. Reid accused McConnell of opposing the measure over the “procedural matter” of not being able to offer amendments to the Ex-Im bill, a view echoed by private -sector sources ahead of the vote. Only three Republicans, Sens. Dean Heller (R-NV), Scott Brown (R-MA) and Susan Collins (R-ME), voted in favor of the Cantwell amendment. The amendment failed to attract support even from two of the Republicans who co-sponsored it, Sens. Lindsey Graham (R-SC) and Richard Shelby (R-AL). Sen. Mark Kirk (R-IL) also co-sponsored the amendment, but he was not present at today’s Senate session. Sen. Bernie Sanders (I-VT), who caucuses with the Democrats, voted against cloture. The cloture vote on Cantwell’s amendment was preceded by a vote to invoke cloture on a substitute amendment to H.R. 3606, which that would add further investor protections to that bill. It also failed by a 55 to 45 vote. The Senate was scheduled to hold a cloture vote on H.R. 3606 following votes on the two amendments, but Reid announced soon after the vote on Cantwell’s amendment that there would be no more votes during the session. The Senate is scheduled to resume consideration of H.R. 3606 during the March 21 session. 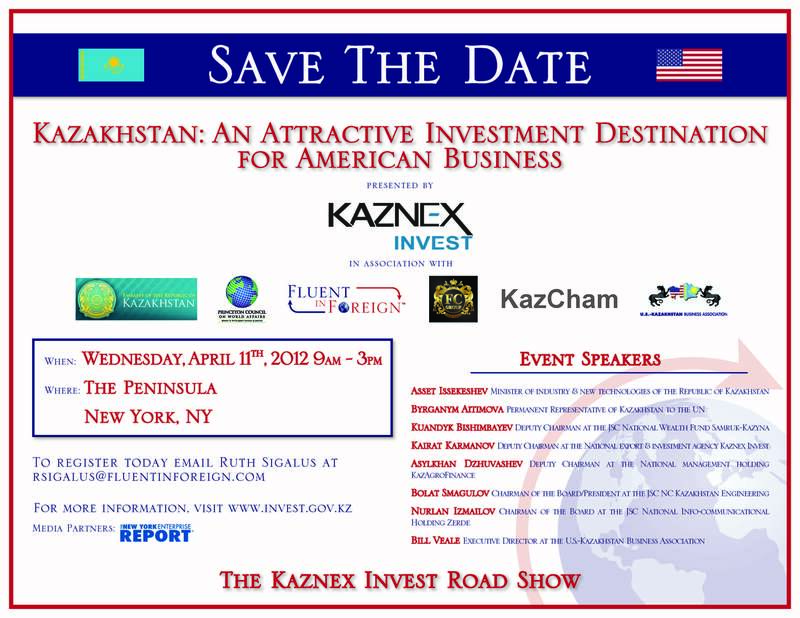 KAZNEX INVEST, Kazakhstan’s Export & Investment Agency Holding Investment Projects Road Show in U.S.
NEW YORK, March 15, 2012 /PRNewswire/ — KAZNEX INVEST, the National Export and Investment Agency of Kazakhstan, has signed a cooperation memorandum with Fluent in Foreign(TM) LLC (fluentinforeign.com),to oversee a series of investor road show presentations in the United States. The presentations will take place in major U.S. cities, where Kazakhstani government officials and business leaders will present a wide range of current and planned investment projects and opportunities open to Foreign Direct Investment by American businesses and investors. Fluent in Foreign is part of an international financial advisory group that guides companies and organizations doing business and investing in overseas markets. The organizer of the road show is Kazakhstan’s National Export and Investment Agency, KAZNEX INVEST, which provides free “one-stop-shop” services for investors worldwide. Co-organizers of this event are the Embassy of Kazakhstan in the U.S., Kazakhstan Chamber of Commerce, Princeton Council on World Affairs and the U.S.- Kazakhstan Business Association. The Minister of Industry and New Technologies, Hon. Asset Issekeshev will head the Kazakh delegation that will include several high-level officials and business leaders representing a wide range of Kazakh business sectors. The first events are scheduled for Washington, D.C. on April 10, New York on April 11 and Chicago on April 12. To request an invitation to the events, contact Ruth Sigalus at: rsigalus@fluentinforeign.com or visit http://www.invest.gov.kz for more information. Although Kazakhstan is one of the biggest countries in the world, with vast deposits of natural resources, the government is shifting its priority from oil, gas and metals exploration and production to the development of non-extracting industries. In 2010, Kazakhstan President Mr. Nursultan Nazarbayev introduced a five-year state program for accelerated industrial and innovative development, providing economic preferences to foreign investors and opening Kazakhstan to the international business sector to build stable, progressive and mutually beneficial economic collaborations. This road show is the first event that is entirely devoted to the presentation of investment opportunities in priority sectors in Kazakhstan. It will focus on the six main sectors of the economy: agriculture, chemical and petrochemical, machinery, metallurgy, IT and telecommunications. “Kazakhstan has rapidly emerged as a nation that, through favorable legislation and market reforms, offers international trade and investment opportunities at all levels,” said Gordin. 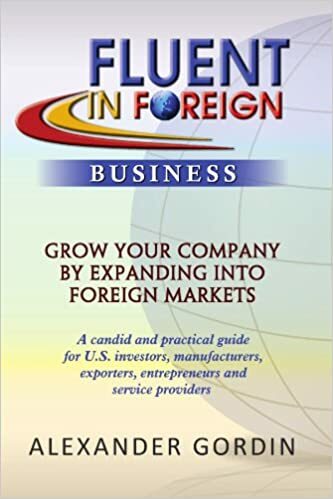 “There are tremendous growth prospects in a variety of business sectors.” Last year Gordin wrote Fluent in Foreign Business, which is a practical guidebook for U.S. companies looking to do business overseas, especially in emerging markets. Priority industries for Kazakhstan’s government include agriculture and food, alternative energy, aerospace, telecommunications, biotechnology, chemicals, construction, machinery, mechanical engineering, metals and light industry. The Customs Union of Kazakhstan, Russia and Belarus, with about 170 million people and total GDP of USD 2 trillion provides additional possibilities for investors and new horizons for effective realization of investment projects in Kazakhstan. Investors will be able to freely promote their products in the Russian and Belarusian markets. Kazakhstan’s competitive advantage is its more favorable business environment in comparison with the other countries in the Customs Union. According to the World BankDoing Business 2012 report, the Russian Federation and Belarus rank 69 and 120 respectively, while Kazakhstan is 47th. Kazakhstan had $1.8 billion direct investment in 2010. The major ratings agencies give Kazakhstan a stable to positive outlook, and the GDP growth rate for 2012 is projected at 5.6 percent. Admission to the road show events will be complimentary and offered to qualified participants by invitation only. After the presentation there will be opportunities for one-on-one networking with Kazakhstan officials and corporate managers. 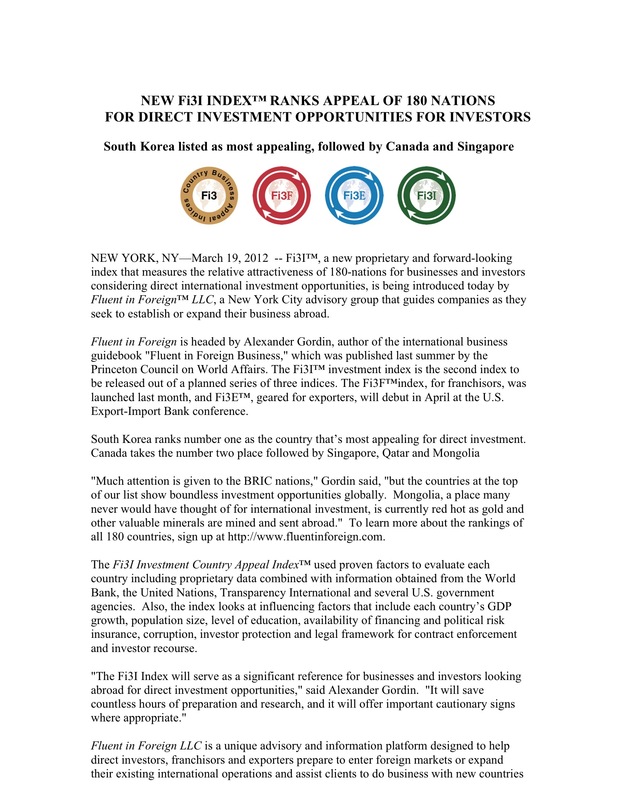 Fluent in Foreign LLC, based in New York, is a unique advisory and information service designed to help direct investors, franchisors and exporters prepare to enter or expand operations in foreign markets. The company publishes a number of proprietary analytical tools including the Fi180 Global Business Atlas and Fi3 Country Appeal Indices, which rank Kazakhstan’s appeal to investors at 70.6 out possible 100 points. Services include education, financing, political risk insurance, legal compliance and strategic business development for companies seeking to enter foreign markets. U.S. Ex-Im – Closed for Business? It is with great horror and consternation that I read the post published couple of days ago in the Inside U.S. Trade blog titled “House GOP Leadership Proposes Long-Term Phaseout of Ex-Im Financing.” It is another example of how bloated and uncompetitive corporations, rather than shape up and cut costs, use lobbying to accomplish their goals while creating economic havoc around them. Earlier this year we reported at length in this publication about several U.S. airlines that, through their lobbying group The Air Transport Association of America Inc. (now called Airlines for America), have been trying to stop sales of U.S. Ex-Im financed planes to Air India. The group has waged a massive public relations campaign, followed by a legal challenge (Air Transport Association of America Inc. v. Export-Import Bank of the United States, 11-cv-2024, U.S. District Court, District of Columbia [Washington]), and now followed by congressional blackmail and an outlandish proposal to phase out the U.S. Export-Import bank and other Export-Credit Agencies (ECA’s) for developed countries, which are part of OECD. With Congress trying to tie long-term phase out of ECA’s as a condition of short-term reauthorization for the U.S. Ex-Im bank, once again we have a case of a reactionary bandaid measure being proposed instead of a fundamental strategic look at improving and reforming of ECA operations, as ECAs are among the most effective and fundamental tools of international trade finance and credit insurance. A rash call for ECA phaseout is not only impractical, but it will serve to make the U.S. and other OECD countries much less competitive on the world stage, as non OECD emerging market countries such as China, Brazil, Russia will move in to fill the void with their ECA’s offering subsidized financing for their goods and services and further crippling exports for U.S. and other developed nations. U.S. Ex-Im and other ECAs are not perfect, but they serve a tremendous economic function and help facilitate hundreds of billions of dollars of international trade. They help American businesses grow, create American jobs, and help mitigate risks that oftentimes hamper cross-border trade. Yet in this political quagmire, two things are distinctly absent – a plan for Delta, and other U.S. airlines that are attacking Ex-Im to reform themselves and become more globally competitive, and a call by lawmakers to examine how U.S. Ex-Im’s operations can be adjusted and streamlined to make the bank more competitive, more efficient and better positioned to support our nation’s industries and service providers for years to come. Both of these things are not only possible, but sorely needed. The financial and political capital that is being spent to wage this nasty reauthorization battle should be directed toward constructive actions and solutions. Yet, I guess it is easier to shift the blame, sling dirt and use lobbying to protect unsustainable economic positions. In the negotiations to break a deadlock over legislation to reauthorize the Export-Import Bank, the House Republican leadership is pushing for a reauthorization bill that aims to phase out official export financing in general, and specifically for commercial aircraft, according to informed sources. The leadership is seeking to include language into the bill requiring the president to initiate negotiations with major exporting countries to end export financing programs. It is also demanding language to reduce export financing for aircraft with the goal of ultimately eliminating such financing. This language is part of a draft bill dated March 2 that the House GOP leadership circulated to stakeholders for feedback earlier this month, sources said. A copy of the draft bill was obtained by Inside U.S. Trade. Conservative Republicans in both chambers — and conservative groups such as the Club for Growth — object to Ex-Im reauthorization because they consider the bank to provide “corporate welfare” that distorts the free market. At the same time, House Republicans are under pressure from Boeing and business groups, including the U.S. Chamber of Commerce, to approve a long-term reauthorization of the bank. A GOP leadership aide would not comment on the March 2 draft bill because negotiations are still ongoing. The aide said the office of House Majority Leader Eric Cantor (R-VA) is still in talks with House Democrats to come to an agreement on Ex-Im legislation. Cantor hopes to consider a bill on the floor by the end of March, according to the aide. In addition, the March 2 draft bill would extend the bank’s charter by one year and increase Ex-Im’s lending authority to $113 billion from the current level of $100 billion. That gives the bank less leeway than draft legislation agreed upon late last year by the House and Senate committees of jurisdiction, which would have extended the Ex-Im charter by four years and raised the exposure cap to $135 billion (Inside U.S. Trade, Dec. 23). The Obama administration, which had initially requested an increase to $140 billion, has said Ex-Im is expected to reach its current $100 billion exposure cap by the end of March (Inside U.S. Trade, Feb. 24). The administration official said requiring the president to enter into negotiations to end export credit financing ignores the fact that the administration cannot force other countries such as China and Brazil to agree to such a deal. Major developed economies already have non-binding guidelines governing the provision of official export credit negotiated in the Organization for Economic Cooperation and Development (OECD). Countries also have specific guidelines dealing with export financing for aircraft under the Aircraft Sector Understanding (ASU), which is also housed in the OECD. The opposition to Ex-Im reauthorization has been partially fueled by a fight in which Delta Airlines and other U.S. airlines have charged that Ex-Im financing for Boeing aircraft exports to India and other countries has led to a persistent oversupply of airline seats that has harmed their business. These airlines have filed a legal challenge against Ex-Im in a bid block loan guarantees to Air India, although a judge earlier this year rejected the airlines’ move for a preliminary injunction (Inside U.S. Trade, Feb. 10). “Our position is that we do not oppose the bank’s reauthorization — we just want to ensure that Delta’s employees are treated fairly in the process,” Delta spokesman Trebor Banstetter said in an e-mailed statement. Ex-Im’s charter is set to expire on May 31. The Export-Import Bank Reauthorization Act of 2006 authorized the charter through Sept. 30, 2011, and since then Congress has extended it three times on a short-term basis without changes. As U.S. domestic recovery slowly takes root, many franchisors are faced with a bit of a dilemma on how to balance international expansion with domestic growth. For small and medium size companies focusing on two fronts may be highly challenging, yet international markets represent amazing opportunities, which cannot be ignored. Even for larger companies, putting together an effective international strategy, while restructuring debt and squeezing maximum efficiency out of battered domestic operations, is not an easy undertaking. The article below illustrates how Domino’s Pizza is effectively managing this delicate task.